Apollo 17 commander Eugene A. Cernan is mounting the best transportation system seen on the moon in the last four and one half billion years. The lunar rover is a unique product of American ingenuity, designed and built to perform one task very well. That single task is to move two American astronauts and their equipment and collected lunar samples swiftly and safely from one geologic site to the next in support of their exploration of the moon. Gene and his teammate, astronaut geologist Harrison "Jack" Schmitt, are glad they have a rover. Their landing site, Taurus-Littrow Valley, is large, and there are a number of important sites to be explored, way too many and too far apart to do so on foot. They are on a tight timeline and everything is going pretty much as planned. Gene has been going full out with four-wheel drive and fore and aft steering most of the time. The four electric motors, one on each wheel, produced about seven miles per hour. This may not sound like much, but with boulders and craters all about, Gene and Jack thought it was just right. In fact, Gene reported he could feel the rear end break loose in about half of the turns. Gene added, "It's a vehicle that you have to drive to get accustomed to. It's one you approach slowly, and then you begin to peak out. Before long you begin to live up to the rover's maximum performance capabilities." The suspension system was outstanding. "I negotiated some relatively good sized rocks, 10 to 12 inches or so, head on, and the vehicle just walked right over these rocks without any difficulty at all." I know I would not want to try that in my SUV here on planet Earth. Now that I think about our concerns here on good old planet Earth, maybe we should be using more rovers for transportation as they are fully electric and have no carbon footprint. The only drawback I can see is that to design and build four of them cost NASA 38 million dollars back in the 1970s. Each would be about 53 million in today's dollars. 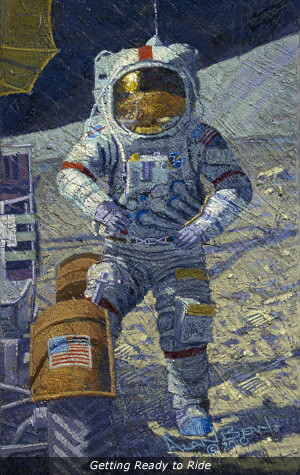 Copyright © 2008-2019 by Alan Bean. All rights reserved.